A common question that receives the common response, “It depends.” The major determining factors are how much energy is available in the waste stream, and what electrical rates are available from your utility. There are other factors as well. Our digesters are scalable and accommodate a wide range of waste volumes. For example, our dairy farm customers range in size from 600 cows to over 10,000 head (and multiples for larger dairies). What are your digester’s products/revenue streams? Biogas, which can be used to create electricity or in a boiler to create steam. Or it can be scrubbed to create natural gas. Other revenue streams include a solid, a liquid and waste heat. 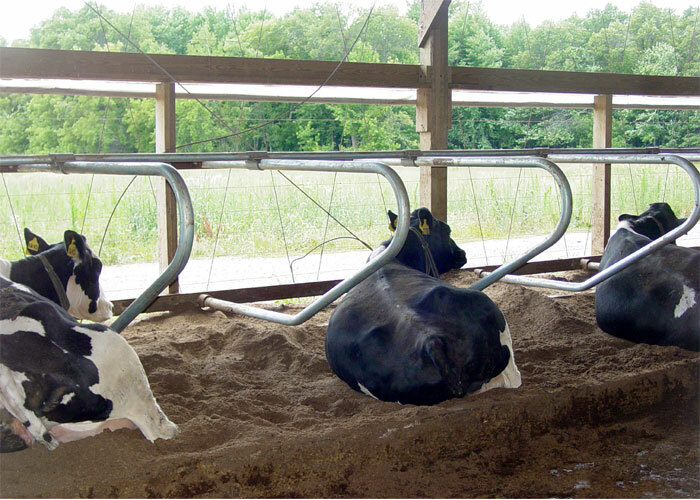 The digested solids can be used as a high-quality animal bedding (replacing other bedding sources such as sand or sawdust). The solids can also be sold as a peat-moss replacement or a fertilizer. The digested liquid effluent can be applied to a growing crop, reducing the likelihood of runoff and increasing crop yield. Other revenue streams include the possible sale of carbon credits, renewable energy credits, and the Federal Production Tax Credit. As my operation expands, can my digester expand with it? Yes. There are two ways in which to expand your digester: One way is to lengthen the digester similar to the way one might lengthen a barn. The other way is to build a second digester right next to the first and have the two share a common wall. Will the digester take in ALL my biowastes? Yes. They are designed to accept a wide variety of organic wastes, with a range of solids content. Can I add additional energy substrates to my digester? Such as food wastes? Absolutely. DVO's unique 2-stage "Mixed Plug-FlowTM" design actually does a more thorough job of processing food wastes and other energy substrates, compared to complete-mix/CSTR and other digesters. This is partly due to our guaranteed retention time. — namely, waste does not leave the system "too soon". For this reason DVO also does a better job of pathogen and odor destruction. However, before adding any substrate for the first time we recommend a lab analysis be performed on a sample to ensure that there are no bactericides, high salt concentrations, etc. that might disrupt the digestion process. Is it possible to store biogas and generate power during peak hours only? Yes it is — when it is economically practical to do so. But that is not typical. To take advantage of a higher peak rate one must install 2-3x the power generation equipment (to burn the gas created during off-peak hours in a shortened timeframe) — which engines will also then be cycled on/off and idled daily. Cycling engines is hard on them and as a result their maintenance costs also increase. In short: When the financial return of biogas storage more than covers significant additional capital and operating expenses, DVO can provide this capability. What happens to the nutrients in the manure/biowaste? No nutrients are lost. The digester only breaks down carbon-based molecules ¬— it cannot break down any nitrogen, potassium or phosphorous. However, it does change the form of the nutrients take, from an organic state to an inorganic state. That means that the nutrients are more "plant-accessible", which is why the liquid coming from a digester can be applied to a growing crop without burning the leaves. In fact, the nutrients will act as an excellent starter fertilizer. What do I do with the liquid from the digester? Since the digester changes the nutrients and waste from primarily organic to primarily inorganic, you can apply the digested liquid directly to a growing crop without fear of burning the leaves or killing the plant. As a result, our farmers typically hold their digested liquid for use during the growing season to increase their crop yield (often, significantly). Optionally, DVO can treat the digestate, concentrate the nutrients and recycle the digestate to wetten incoming (drier) wastes. For examnple, this process is necessary to economically digest poultry litter. What will my utility pay for the electricity? This will differ greatly from state to state, and region to region. Yes, and we can assist you with the application process. Are financial grants available from my state? Some states offer grants. We can determine if you qualify and help you apply for them. Why has DVO's patented "Mixed Plug-FlowTM" design become the U.S. market leader? Our system substantially outperforms the other technologies such as "complete-mix" and the even older "plug-flow" (non-mixing) systems... by producing more biogas per unit of feedstock, more efficiently and with reduced maintenance costs. It is also maintains a more robust and stable operation. Owners appreciate that DVO digesters are designed to be operated and maintained by their own staff, not requiring trained technicians. How do I know yours is a good design (everyone else claims theirs is "the best available)?" Don't take our word for it. The U.S. EPA keeps track of farm digester installations in the USA http://www.epa.gov/agstar/downloads/digesters_all.xls One can download this Excel spreadsheet, sort it by the "System Designer" column, and you will see how many DVO has sold in the previous few years (versus competing systems). And, you will also see repeat DVO customers – a key indicator of customer satisfaction. Talk directly to our customers. Any of them. Unlike others we don't provide a (carefully vetted) "referral sheet." Our customers are our “best salespeople”, and we encourage you to ask them about their own experience with our system. For example, in the dairy industry some of the largest and most respected names (such as Fair Oaks, Bos, and Bettencourt) and operations of all sizes and configurations (scrape, flush, vac, sand etc. ), employ our system. DVO minimizes using mechanical mixers in favor of a proprietary, patented biogas recirculation system. Why? Mechanical mixers require more energy to adequately mix the same amount of liquid, which reduces the output and efficiency of the system. Furthermore, anything that is more mechanical and complex is inherently less reliable and will require more maintenance. Why do DVO digesters see a much better pathogen reduction than the "complete-mix" or "plug-flow" designs? 3rd party figures are publicly available (see above-referenced "EPA - Gordondale" report available on our website) where others typically do not. For pathogens that cause farmers problems such as E-coli and salmonella, we see a 97-99% removal. Often lab reports come back "none detected." This is only possible because our design offers a guaranteed hydraulic retention time (HRT) -- which means every unit of waste that goes into our digester is retained and processed for a guaranteed number of days. In a complete-mix digester this is impossible. Some waste leaves the system too soon (waste not fully digested will contain many more pathogens, and energy not harvested), and some is also left in and processed longer than necessary, which reduces system efficiency. And, you can't kill the same pathogen more than once. Is your "Guaranteed Retention Time" also one reason why DVO digesters produce more biogas using the same feedstocks, than other designs? Yes. And also why we see better odor reduction and pathogen control. Why do DVO's biosolids have the reputation of being an excellent bedding material for animals? Our guaranteed HRT means that all the waste is uniformly processed. None leaves the vessel too soon. In a "Complete-Mix"/CSTR digester some of the waste leaves too soon (leaving food for bacteria, odor and pathogens), and some remains for longer than desired (decreasing processing efficiency). What are the advantages to having a hard, insulated concrete top vs. the "soft top" seen on earlier designs? For one, concrete lasts a long, long time. Soft tops can be damaged (by high winds/lightning/storms, by the sun’s UV rays, by farm tools/implements etc.) and sometimes need to be completely replaced. Heat mostly wants to escape through the top (which is why we wear hats in winter). A better insulated concrete vessel means reduced energy required to maintain the correct temperatures = higher operating efficiency = higher performance. Soft tops can sometimes be cheaper to install initially, but because of this loss of operational efficiency soft tops cost much more over time ─ even if you are fortunate to not have to replace them due to damage. Our concrete cover does not have to be removed should the digester ever need to be emptied or cleaned out (i.e. for a planned expansion of capacity). Vessel accessibility is built into our design.